NJB Article and Source Repository: Sykes-Picot – The Centennial of an Imperial Curse. By Hisham Melhem. Sykes-Picot – The Centennial of an Imperial Curse. By Hisham Melhem. 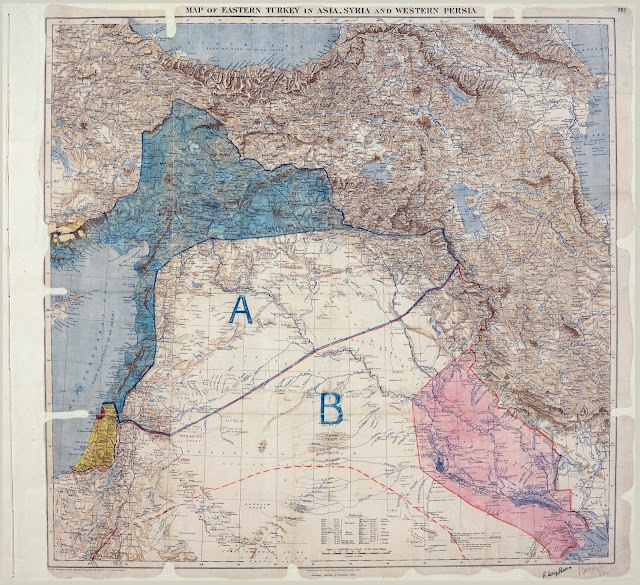 Sykes-Picot Agreement Map. MPK 1/426, UK National Archives. Wikipedia. Sykes-Picot – The centennial of an imperial curse. By Hisham Melhem. Al Arabiya English, May 21, 2016. For my generation of Arabs, the “Asia Minor Agreement”, better known as the Sykes-Picot Agreement, came to symbolize imperial betrayal and treachery, a secret scheme signed in May 1916 by Mark Sykes, a British diplomat, and François Georges-Picot his French counterpart representing the two victorious European Empires in WWI to divide the imperial inheritance of the dying Ottoman Empire. In the collective mind of the peoples living in what used to be called Asia Minor and the Fertile Crescent, Sykes and Picot became names that shall live in infamy, for they imposed an imperial construct by etching arbitrary lines and coloring zones of influence on a map, and establishing artificial entities over these regions that have been inhabited by a rich mosaic of peoples, ethnicities, cultures, and religions over millennia of successive civilizations. The Sykes-Picot scheme, like the subsequent agreements, deals, declarations, conferences born out of the crucible of the First World War to create a new order in the land then known as the Near East, were predicated on denying the agency of the human beings who called these regions home. In the decades following the agreement, “Sykes-Picot” became a convenient excuse, and an attractive shorthand used by successive Arab autocrats, despots and ruling elites to justify their disastrous failures at providing good governance, and to explain all the political and economic ills of the region for a full century. To paraphrase Shakespeare, the fault is not in the borders, arbitrary as they may have been, but in what the Arabs have done and not done within the borders. Huge amount of ink has been shed on the centennial of the map that was born out of the ashes of the First World War and seems to be unraveling now in a crescendo of similar violent upheavals, calamities and disastrous dislocations. But does “Sykes-Picot” deserve this pride of place in the hierarchy of modern Middle Eastern disasters? To begin with, the Sykes-Picot borders and zones of influence have very little in common with the current borders in the Middle East. But what makes the Sykes-Picot scheme to slice the carcass of the Ottoman Empire stand out is the fact that it was the first of subsequent attempts by Western powers in the decade that followed the war to divide the region. The British issued deceptive and contradictory promises and declarations (the McMahon–Hussein Correspondence and the Balfour Declaration) for the Arabs and the Zionist movement, and in a series of post-war conferences held in locals with strange names for the peoples of the region; The Versailles Peace Conference, The Treaty of Sèvres, the San Remo Conference and the Treaty of Lausanne, most of the current borders of the Middle East were finalized. Again with no regard whatsoever, to the wishes of the peoples whose futures were being shaped by imperial writ. But the imposition of these maps did not go unchallenged and in fact inspired Arab and Turkish nationalisms. The Turks under the capable leadership of a former Ottoman officer, Mustafa Kemal (Ataturk) undermined both the Sykes-Picot agreement and the Treaty of Sèvres which sought to dismember Anatolia. However, the Arabs led by Faisal Bin Hussein who established the independent Arab Kingdom in March1920 encompassing modern-day Syria, Lebanon, Jordan, Palestine and parts of Turkey, could not defend their new brittle realm against the onslaught of France’s Army of the Levant at the battle of Maysalun near Damascus four months later. The French sought to weaken the nationalist impulses in Syria, by the creation of sectarian statelets for the Alawites on the Mediterranean coast, and for the Druze in the South as well as around the historic cities of Damascus and Aleppo. But these cynical plans for divide and rule were resisted by most Syrians. During the last century the legacy of the “artificial” borders spawned by Sikes-Picot was repeatedly assaulted politically and in some places were changed by military force, as was the case following the Arab-Israeli wars, and recently with the rise of the self-declared Islamic State (ISIS) which following its control of large swaths of land in both Iraq and Syrian, bulldozed the earthen berms marking the border and declaring “the end of Sykes-Picot”. But decades of grievances against Sykes-Picot elevated it into a mythical status in the minds of many Arabs, a malignant milestone in their modern history, a scapegoat explaining the perennial question asked by generations of Arabs in the last hundred years: what went wrong? True, the current borders of the Middle East are “artificial”, but most borders in the world are artificial, they are drawn by agreement or as a result of conflicts and don’t necessarily follow natural boundaries like river basins or mountain ranges; and most midsize and large states are heterogeneous with diverse ethnicities, religions and languages. And while the borders of the modern Middle East were arbitrarily drawn, they were not totally without basis, and in fact some borders were somewhat based on the Ottoman vilāyet (from the Arabic Wilaya) administrative system. Arab and Syrian Nationalists in Syria and Iraq would always complain that they were living in truncated states; but if mandated Syria had included Northeastern Lebanon, Northern Palestine and Alexandretta (in present day Turkey), areas Syrian Nationalists craved because they were at times ruled by Damascus, does that mean that Syria would have developed a just, modern, viable and better representative polity? If the Hashemite Kingdom of Iraq had included the old Trans-Jordan and Kuwait, would it follow that Iraq would have followed a radically different political trajectory? We cannot say for sure. But it is very likely, that a larger Iraq and a larger Syria would have ended up where their truncated versions are today. If the Arab Kingdom was not dismantled by the French, in one fell swoop, chances are that it would have gradually unraveled by Turkish Nationalist opposition, and its rejection by the non-Muslim and non-Arab communities within its “artificial “borders. Creating countries with diverse communities, particularly in the aftermath of upheavals and wars, is always arbitrary, violent and messy, particularly if the new entities are led by oppressive or non-representative regimes and if the basic political and cultural rights of the various communities are not recognized. This is the modern tale of Syria and Iraq. The Ottoman Empire ruled the region for four centuries, before the return of the European armies to the Middle East for the first time since the Medieval Mamluk dynasty that ruled Egypt and Syria drove the Crusaders from their last coastal outpost in Acre, in 1291, thus ending their long occupation of parts of Anatolia, Syria and Palestine. The defeated Ottoman Empire left behind a devastated Levant and Mesopotamia as a result of war, and famine where whole communities were uprooted and turned into refugees, while others were subjected to mass killings. During the Ottoman centuries the region was controlled by the Sublime Porte in Istanbul through the vilāyet system centered on the historic cities of Damascus, Mosul, Baghdad, and others. Local communities were left to their own devices as long as they paid taxes and did not undermine order. Some communities like the Druse and Maronites of Mount Lebanon enjoyed considerable local autonomy and sometimes decades would pass without these communities encounter a single Ottoman soldier. The various peoples of the region; Arabs, Kurds, Muslims, Christians, Jews and others did mostly co-exist, although there were occasional spasms of religious and ethnic violence and mass killings particularly during the long decline of the Empire in the 19th century. Local leaders representing powerful, domineering feudal families working on behalf of the Sublime Porte, maintained order with an iron fist, and they showed no mercy when confronting social and political protests. The demise of Ottoman rule exposed a region bereft of political traditions, modern governing institutions and skilled and experienced political elites capable of immediately taking charge of large and diverse societies still reeling from the horrific ravages of a world war. Although the war ravaged and partitioned Anatolia, but the emerging Turkish Republic was able to drive the foreign armies from its territories and establish a modern nation-state in part because it was able to rebuild its state institutions and economy and fostered a strong sense of nationhood and quickly established a strong centralized authority. Most of these attributes were lacking in the fragmented lands of the Levant and Mesopotamia. One cannot but ask an intriguing question in this context. What would have happened, if the British/French mandate system was not imposed on the region following the end of the Ottoman centuries? Would it be a stretch to answer: chaos and violence? We will never know for sure, but given the history of the region, the lack of viable institutions, its breathtaking diversity and its tragic conditions after the war, chaos and violence were likely to ensue in the absence of a dominant power exercising control. Scholars and historians will be writing and speculating about the causes of the current convulsions and the absence of good governance in many Arab lands, not only in the Levant and Iraq, but also in Libya, Yemen and beyond for years to come. What is clear is that borders in themselves, are not the causes of Arab dysfunction, or the reasons why Arab civil societies were stunted and never allowed to develop into vibrancy, even in those countries that had nascent civil societies, a modicum of state institutions and relatively modern educational systems, such as Egypt, Iraq, Syria during the period between the two World Wars. In fact there was in these countries from the 1920’s until the late 1940’s and early 1950’s before the onslaught of the Arab militaries against state and society, a semblance of political life, the beginning of admittedly wobbly parliamentary traditions, vibrant cultural debates, considerable artistic creation, a growing space for free expression with noticeable participation of women and minorities in all of these spheres. But these fragile societies were not allowed to strengthen their state institutions, allow political parties to fully function as legitimate political forces, and the Judiciary was never allowed by the ruling elites to become truly independent. Then winter descended on the Arabs in the form of military coups masquerading as revolutions claiming to redress the loss of Palestine, to undo the vestiges of colonialism and imperialism, to revive the glory days of the Arabs of medieval times, to build powerful militarized states, and strong economies. These Arab praetorian forces failed in all endeavors. The leaders of these societies where transformed from autocrats, some of them benign, who would not countenance widespread terror or mass killings, into ruthless and vengeful tyrants more than willing to engage in wanton and gratuitous terror against their own peoples and commit crimes against humanity as we have seen in Iraq, Libya and Syria. These are the men who waged war on the minorities, some of them with deep roots in the region that predate Arabs and Muslims. In recent decades and long before the season of Arab uprisings, we have witnessed the diminishing of what was left of public spaces, the suffocation of what was left of the basic civil rights of the peoples and even the withering of culture. Those who argue that a different set of borders would have given us different outcomes and good governance should tell us how. One century after Sykes-Picot we are facing a long nightmare: maintaining the old borders, without a radical rearrangement of the political and social contract in these societies and sawing the seeds of good governance, means perpetual conflict. The paradox is if political solutions are predicated on the reconfigurations of the current borders of Iraq and Syria (the same goes for Libya and Yemen), such change could conceivably spark ethnic and sectarian cleansings, claims and counterclaims and new cycles of violence. The breakup of Sudan is very close to home. Breaking up countries with diverse groups is as messy, violent and uncertain as creating them.